One of the regular dance outfits on the UK scene is MK DANCE GROUP (now known simply as MK) who have been active since 2010 and have clocked up appearances at events such as MCM Expo and Hyper Japan. The outfit is also well known for featuring the likes of Kelsey Ellison and Scarlett Young amongst its ranks. Can you talk a little about MK’s origins and how you think the group has developed since its inception? The group was created in 2010, we all met up at one of the massive J-Pop dance gatherings that used to be organised over the MCM forums. After that, we decided we wanted to cover a Berryz Koubou dance; formations and all! We organised the dance over the forums and we were then asked to perform at MCM’s next event and performing meant we had to have a name…. and add a few more dances to a setlist, so I guess we kind of became ‘official’ then. After that I guess we had so much fun performing we wanted to keep doing it! At the start we only covered Hello!Project dances, however now we’re covering all sorts of groups – including doing a bit of K-Pop! We’ve also recently undergone a massive overhaul, adding 3 new members, getting new outfits and we’re definitely a lot more strict with ourselves now because we know we want our audience to have fun and work hard to ensure that. However we still make sure we’re enjoying everything too! What’s the process that goes into choosing the songs for the performances? At the start we all voted on dances, however that takes a long while to sort out! Now we have a song suggestion list that we’re always adding things to. Out of those suggestions I’ll then make a ‘provisional setlist’ of songs that I think will look good. We’ll then discuss it and edit it and will eventually come to an agreement. Songs can be changed last minute due to many reasons so some of our setlists have had to be completely changed a week before a performance! I’m hoping we never have to do that again though. You had Andy Lee/KleptoPenguin joining you for some of the routines. What are your thoughts on collaborations? I love them! I’m all about collaborations, Andy initially asked us to perform in his setlist and so we asked him to be in ours. And we’re definitely looking at possible future collaborations. They’re extremely important to do, because when collaborating you get fresh ideas from someone who doesn’t usually perform with you, I found I was greatly inspired by how Andy seems to always have so much fun on stage and that vibe definitely rubbed off on all of MK at Hyper Japan. My advice to anyone looking at collaborating with someone is go for it! It’s so much fun. How much rehearsal time did you undertake for the Hyper Japan performances? It was difficult for Hyper Japan; because it was only 3 weeks after MCM, we usually have 6 months between performances! A lot of our setlist was a repeat of MCM however there were at least 3 new dances. It’s also difficult to get everyone together so for this one I’d say we had a couple of hours. And we never actually rehearsed properly as a full group. Before our performance we were behind the stage frantically going through formations! Do you think events such as Hyper Japan are important for UK performers? Definitely! Hyper Japan seemed to be amazing in terms of the friendships that were made between the UK performers. We all supported each other’s performances and there wasn’t any rivalries going on at all, which was a joy to see. For those who want to break into the Japanese market such as the singers, it’s vitally important for them to perform there to promote themselves as it’s exactly the right people to perform to. It’s also important to watch other performers and learn from them so you can continue to improve. The outfits certainly gave MK more flourish on stage. How did this idea come about and who designed the outfits? Thank you! I’m very proud of them They were designed through a discussion between all of us and we threw ideas around for a few months. Then Ploy (who wears orange in our performances) got the T-Shirts designed and printed. She also made our caplets for our Hyper Japan performance. Bernie (who wears purple) made our skirts. They were all individually dyed and they look amazing! She worked so hard on them and it all paid off. I’m interested in having another outfit so we can alternate them from performance to performance so people don’t get bored of our usual one. But that might take a while as these were pretty expensive! And I love the current ones too much. Where do you see MK in the future? I see us performing at a lot more events. We have a panel planned for AmeChibi next April and also we’re hopefully doing something for Kitacon. Entry, travel and accommodation for these are all pretty expensive though so the dream is to be invited to a convention in 2015! The big dream for me is to perform at one of the Nico Nico Douga events in Japan or something like Moshi Moshi Nippon, that would be amazing. 2014 has been a great year for MK, it’s the first time we’ve performed at an event that’s not MCM and the new members have certainty brought a spark back to the group which I thought was lost. We’re going to work hard to ensure people enjoy our performances! 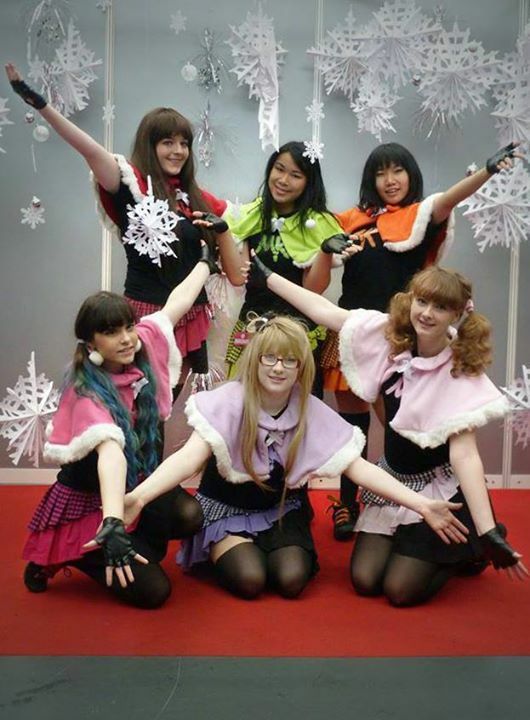 J-Pop Go would like to extend its warmest thanks to Rachel Robertson, the members of MK and also to the HYPER JAPAN team.